I handbuilt something that won't fit in my kiln lying flat (as in image) and wonder if it would work to fire it standing it on its side instead (my kiln is 21" round so it would fit that way). It's 20"W x 20"D x 4"H (wet) and made from slabs which I rolled in every direction (with a rolling pin) and joined with magic water slip. It's almost two entire bags, which means probably about 40 lbs wet. The slabs are about 5/8" thick (wet). I used Laguna B-mix with grog, cone 5. What would happen if I fire it standing on its side without supports? Will it actually need supports? If so, do they need to be fully vitreous or can they be just bisque? Or can they be just greenware like the object itself? Or should they be metal, and if so what kind of metal? What shape should they be and how should I place them? (If you look at the images, the round part is hollow, FYI). This is my first time ever building something this large so I would very much appreciate any info anyone could send my way and thank you in advance! Props would be advisable, as the alternative, is leaning it against the kiln wall, which isn't a great idea. 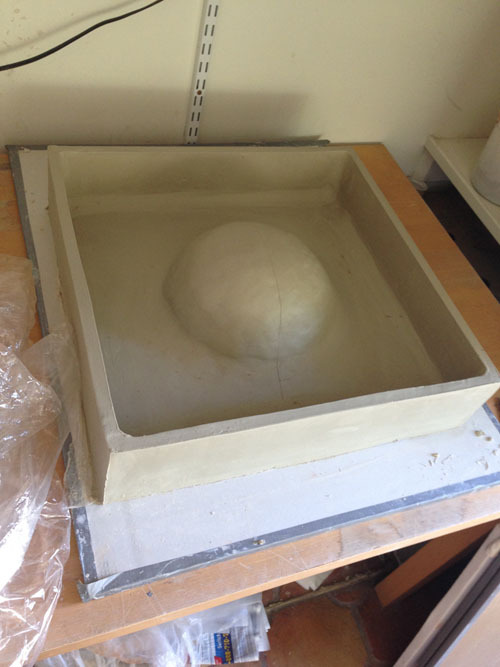 I'd recommend using props that have been bisqued, as they'll be much stronger, than using greenware clay. Your project might actually be OK during the bisque firing. It will be the higher glaze firing, that will cause the slumping/ distortion. If you were firing low, it would be OK, at cone 5, it will sag, if you stand it on its side. I think your first challenge will be getting the piece to dry evenly without warping or cracking. The flat bottom (or top) directly on the ware board could create problems. You need to get either newspaper or plastic or slats underneath so it can move as it shrinks during drying; even flipping it over, you still need to get it on something that allows it to move and to allow air to circulate underneath. Given the flat sides, you might be able to fire it on its side, but you still need to put slats, cookies, or a layer of coarse grit so it can expand and shrink as it fires. But it just can't sit on the kiln shelf or you'll end up with cracks and/or warping. And, fire it slowly to make sure all the moisture is gone. oyyyyy... you're so right, I need to lay it on something that lets it contract while drying!! Likely a two-person operation due to size and weight. 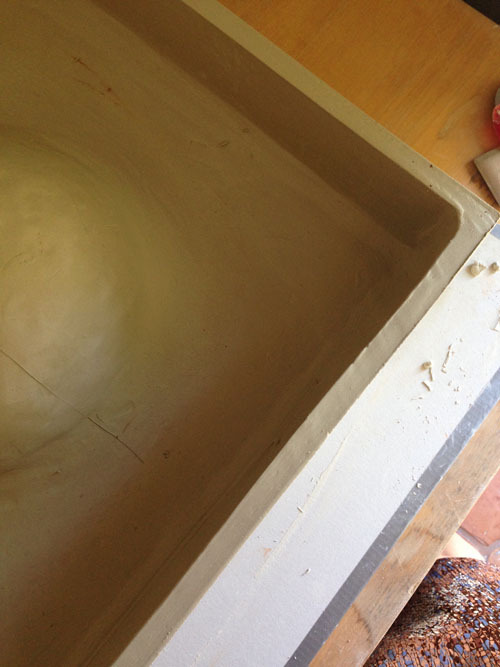 If the clay is real wet, let it set up some before manipulating it further. Lay some newspaper/plastic on the top, them put a piece of ware board on top. Then, in unison on a count of three, the two of you flip the sandwich over. Remove the bottom (now top) ware board. On each of the seams, apply a coat of wax -- that will slow the drying of the clay on the seams which are the weakest point of your ware, and the point that tends to dry first and fastest. Maybe 1/2" on each side of the seam. Then, across the top, place a sheet of newspaper/plastic (if plastic, perforate it with holes so it breathes and lets air in) and then placed some wood slats (similar to those used for rolling slabs and keeping the thickness even; but you'll need four or six of the same width slat). Place your ware board on top of the slats. You and your partner are now ready to flip the sandwich again. Once you flip it, remove the ware board, newspaper/plastic; apply wax to the insides of the seams. Cover loosely with plastic and let it dry slowly. Monitor the seams. Rotate the ware board so if it catches any breeze or airflow, you are controlling the exposure to that draft evenly. Whew. You might want to consider reinforcing the corner seams with a coil; unless you need the straight/sharp corner for aesthetics. A wedge angling down from the corners to the bowl would be a good reinforcement and help it hold its shape against warping. Might be considerations for future iterations. Triangles always are stronger in construction than squares. What clay body is this made from? Drying will be the largest issue 1st. Not familiar with cone 6 b-mix but the cone 10 b -mix I am real familiar with.If it was cone 10 b mix mix warping and cracking would be the norm for this form. These two bodies can take this stress better than tighter bodies. Any loose sculpture clay body will be better. Thanks, Mark. It's actually cone 5 and it's with grog, which I thought would make it less susceptible to warping (on the Laguna site it's described as "more forgiving"), but regardless, both WSO and Big White are for cone 10 only which I don't do. What is the finally use of this? is it going to have glaze?